Pressure Tech - Quality Pressure Regulator Manufacturers - IT'S A GIRL!! 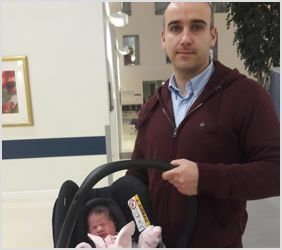 This week was a special week in the Pressure Tech office as Karol, our Senior Design Engineer, announced the birth of his baby daughter, Emilia Maria Wolniewicz. Today is Karol's last day in the office before his two-week paternity leave begins... good luck with the dirty nappies Karol...! We look forward to welcoming him back to the office on Monday 12th November 2018, but in the meantime, the Pressure Tech team will ensure everything is taken care of!